We've received reports that some pesky critters took the Leadeboard icon and it has gone missing. We found out that new features get prioritized and number of icons seen is only 8. 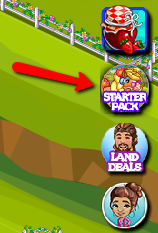 You may simply click the Starter Pack icon, travel to another farm, and refresh FarmVille for your Leaderboard icon to show in the game.